Expandable Celtic charm bangle – one size fits most women. 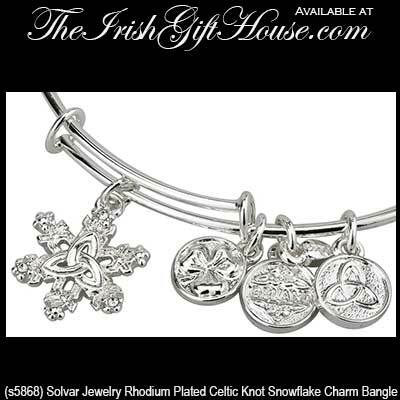 This rhodium Celtic bangle features a snowflake along with a , a second and Ireland charms. This Celtic Christmas bracelet is an - One Size Fits Most. The Celtic Trinity Knot Charm measures 5/8” Diameter. The Claddagh, Shamrock and Ireland Charms are 3/8” Diameter. 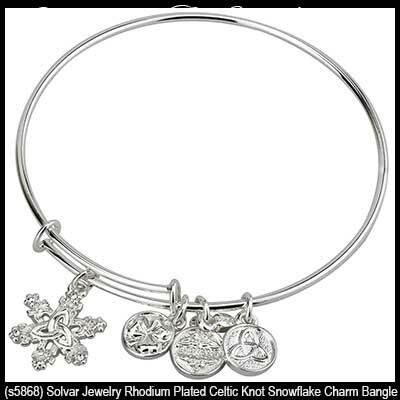 The Ireland Charm Features Celtic Trinity Knots. Sterling silver Celtic snowflake necklace features the Trinity knot along with shimmering CZ stones. Celtic snowflake earrings are cast in sterling silver and feature Trinity knots along with shimmering CZ stones.